The cross-institutional FLEXspace team created a global forum for sharing examples of technology-enhanced learning environments and their impact on teaching and learning. Each image in the FLEXspace database includes robust metadata that organizes content into three taxonomies: learning and assessment, technology integration, and facilities integration. In 2012, the State University of New York was looking for a way to more effectively share information about classroom building and renovation across its 64-campus system. Its vision: a collaborative repository with images and relevant information about examples of learning spaces on campuses across the country. A team quickly began building a proof-of-concept solution that would enable faculty, instructional technologists and facilities planners to share media assets in a structured way. 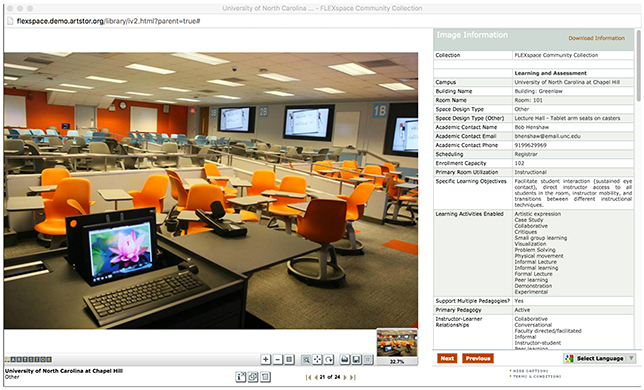 The Flexible Learning Environments eXchange (FLEXspace) was born out of that initial work at SUNY. And thanks to the support of a cross-institutional team of core contributors — including representatives from California State University, Foothill DeAnza and California Community Colleges, the Consortium of College and University Media Centers, InfoComm, the Society for College and University Planning, Educause Learning Initiative and Artstor, as well as corporate sponsors Herman Miller and Crestron — the effort grew into a highly searchable, peer-reviewed repository of technology-enhanced learning spaces, freely available to the higher ed community. It has since been expanding its mission and services to address the need for extensive global conversations on learning impacts and to provide other, new formats for productive information exchange. FLEXspace uses the Artstor Shared Shelf platform to create its open education resource and share it with the higher education community. The online repository focuses on innovation, design and technology, providing extensive examples and high-end photos and illustrations as well as descriptive information and data. Shared Shelf provides a highly accessible, trusted environment that safely and securely stores institutional data, and contributions will remain intact and available in FLEXspace for the long term. A user begins by accessing the public facing FLEXspace website, which describes each project. He or she can then access either the upload functionality (sharing examples of institutional solutions via Artstor's Shared Shelf) or the viewing portal (accessing video, images, and data from the FLEXspace collection). Don't miss "FLEXspace: Sharing the Best of Learning Space Design," an in-depth interview with project lead Lisa Stephens and Rebecca Frazee, FLEXspace manager and lecturer for the Learning Design and Technology program at San Diego State University. Ultimately, FLEXspace, used in conjunction with other resources like the Learning Space Rating System, will not only promote understanding of other institutions' efforts, but also assist individual campus stakeholders in creating master learning space plans. The more aware institutions can be of peer community solutions prior to meeting with architects, technology integrators, planners and donors, the more effective their negotiations can be. The goals are to save time, money and effort in the process of researching and executing the building and renovation of campus learning spaces. Today, FLEXspace is a tool designed to promote common understanding across the faculty, instructional support, facilities and technology integration communities. As project lead Lisa Stephens, senior strategist for SUNY Academic Innovation, University at Buffalo, reflected, "FLEXspace, particularly when coupled with the Learning Space Rating System, is envisioned to be not only an infrastructure or facilities planning tool, but ultimately a forum for learning space designers and builders, as well as faculty using these flexible learning spaces, to engage in global conversations about how space and environment impacts learning effectiveness."